'Fun' isn't a word you'd normally associate with a seven-seater Sport Utility Vehicle (SUV). Practicality, utility, family, sensibility, these are more common words you would use. And we don't blame you. After all, seven-seater SUVs tend to cater to families, and we'd go so far as to call them 'boring'. However, what if we told you there is now a Japanese seven-seater SUV capable of putting a smile on your face and makes you laugh out loud? Yes, the new second generation Mazda CX-9 is capable of that. We kid you not. Not at all. The big news here is the new 2.5-litre turbocharged SKYACTIV-G engine that sits under the bonnet, churning out 228bhp and 420Nm of torque. We hopped in, put pedal to the metal, and reacted thus, "Hahahahahaha!" The CX-9 is pretty damn hilarious - something we never imagine we'd say about a seven-seater family hauler. It has a hell of a lot of power, to a slightly ludicrous point. 0-100km/h takes 8.2 seconds, which is quick for a car weighing in at 1,898kg. And that power is sent strictly to the front wheels on our test car (though there is an all-wheel drive version available, which arguably makes better sense). This is a seven-seat front-wheel drive SUV capable of wheelspins. No, we aren't taking the piss. When making a turn or u-turn from a standstill, you do have to be conservative with the throttle if you don't want to hear the tyres screech, the traction control light come on, and have other drivers cursing and swearing at you. Driven sensibly, the CX-9 cruises along quietly and comfortably. Get into a few corners and it performs admirably - the chassis feels tight and steering reasonably sharp, and the car handles in a manner quite unbecoming of a car its size. However, there's definitely an amount of body roll and wobble around corners. Ironically, we think this actually adds to the hilarity of the driving experience. It feels altogether playful and naughty. But wait, this is supposed to be a family car! It is, though. It's big and spacious on the inside, and the third row will reasonably fit Singaporean adults. The boot will fit 230 litres of cargo, and that can be expanded to 840 litres by folding the third row of seats, or 1,848 litres with all five rear seats folded down. 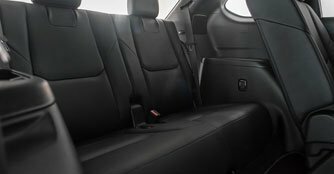 The cabin also feels premium, and the car comes well-equipped. There's an active driving display, a 12-speaker Bose sound system, a sleek 8.0-inch infotainment display and power front seats with memory on the driver's side. There's also a host of safety features to make sure the family is safe. 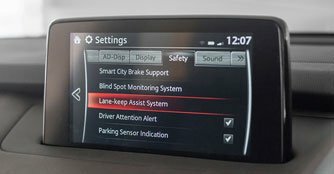 Blind Spot Monitoring system, Rear Cross Traffic Alert, Lane Departure Warning system, Lane Keep Assist, Smart City Brake Support, Front Pedestrian Brake - all of that comes standard. It looks pretty good, eh? Yes, we certainly think so. It keeps in line with the brand's overall KODO - Soul of Motion design language, and looks like a CX-5 on heavy steroids. Its flowing lines, sleek silhouette and sharp details give it a sense of motion. The long nose and big, rounded backside definitely has aesthetic appeal, but in tight spaces it can make you more nervous than you want to be. Trying to negotiate the CX-9 through a tight carpark with small parking lots proved to be a nerve-wrecking experience for us. Mostly, it's the asking price. 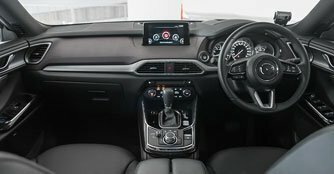 This variant costs $199, 800 (as of 29th November 2017), which means that it slides in at a rather unique position between your more affordable models like the Hyundai Santa Fe and the Kia Sorento and the more premium German options such as the Audi Q7 and the BMW X5. 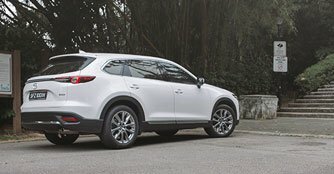 Like we said, the Mazda CX-9 proves to be quite a unique family SUV. It's sensible, practical and utilitarian enough, but it also comes generously well-equipped and feels quite premium. More crucially, what sets it apart is the element of laugh-inducing naughtiness you can find in its powertrain. 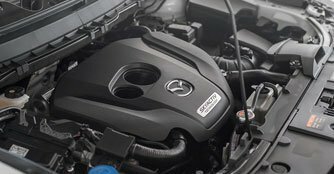 The CX-9 then represents something of a halfway mark between an affordable seven-seater and a premium one, and probably will (and rightfully should) appeal to buyers looking to make that next step up.